Rocky Nook recently published the third edition of Mike Hagen's The Nikon Creative Lighting System and we've been slowly enjoying it for a few weeks now. Nikon's wireless flash system is unmatched whose delight is in the details. And Hagen illuminates every detail. The book is more an encyclopedia of the Creative Lighting System than a manual. Which, given Nikon's obscure documentation, is a good thing. You really need a go-to reference manual for the various strobes and accessories, not to mention the camera settings that make all the magic happen. While the front of the book covers CLS Background and Flash Theory, it also sneaks in a Quick Start Guide right between them so you can get right to work, if you have to. The bulk of the book, which follows that introduction, devotes a chapter to each strobe. Those include the SB-600, SB-800, SB-700, SB-900/910 plus SB-500 strobes and the SU-800/SB-T200/R1C1 close-up lighting kit. Hagen gives you a tour of the hardware before taking your through the often maze-like menu systems of each of them. Hagen goes a bit beyond the manual, though, with a few words of wisdom, too. Where the built-in bounce card is inadequate, for example, he points to some handy (literally) alternatives. The next part of the book gets practical, showing you how to approach the Creative Lighting System, use the wireless capability, understand the audio signals, use gels to deal with white balance issues, pick power options and find the important camera-based functions for flash. But, as we said, the delight is in the details, particularly in Step 2. And Step 1 is no breeze either. Hagen fortunately lists each of Nikon dSLR's sync speeds. And where to find the power setting for Step 3. In the last part of the book, Hagen provides 15 Case Studies and Examples, showing you the final image with its camera and flash settings. And where necessary, he also shows you the lighting setup. It's a mini-course in strobe lighting. He also details his Lighting Kit and Product Recommendations before ending the book with Common Questions and Answers (you know, so it's easy to flip to). As with any encyclopedia, it provides a thorough exploration of the subject. And Hagen's concise style makes it a quick read that gets you up to speed fast. We've relied on the first edition for a while now (our gear is old enough to be covered) and prefer it to the Wiley title by J. Dennis Thomas, primarily because the Rocky Nook book design is much easier on the eyes. So, you know, you don't mind cracking it open. Or, clicking on it. The book is available in a number of ebook formats, too. Having it on your phone as a PDF seems like a pretty smart idea if your work takes you on location. You'll never be without help staring at one of those Nikon strobe LCDs again trying to find something in the menus. 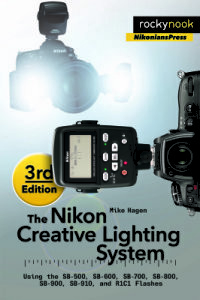 The Nikon Creative Lighting System by Mike Hagen, published by Rocky Nook, 322-pages, $39.95 or $31.95 as an ebook at Rocky Nook.